Generate random numbers for lotteries, contests, prize draws, raffles, researches, surveys, statistical tests, and memory training. Simply choose the number of ranges, specify if you want to generate one number or a list of random numbers, set the range and click "Generate". In addition, you may exclude repeating numbers, sort results, generate numbers of a given length, generated passwords and sequences of random characters, and more. The application allows you to create sets of up to 200 numbers in a range between 0 and 999 999 999. Generated numbers can be displayed in a row or in one or more columns. 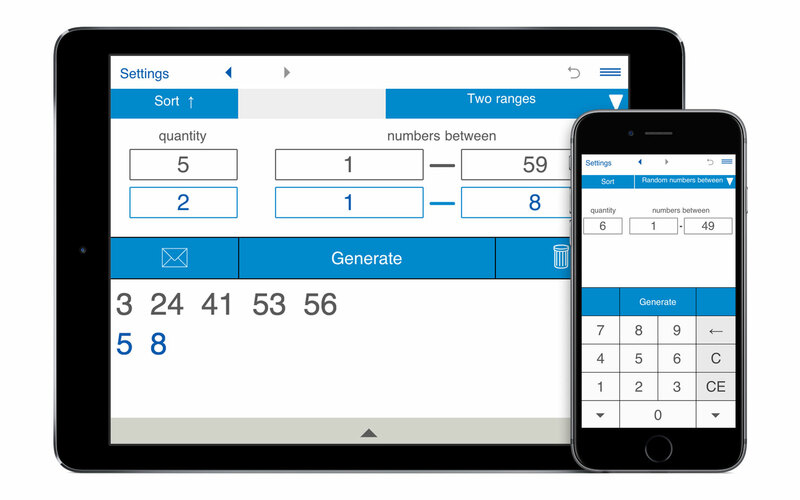 Unlike many apps and services for generating random numbers, Random Number Generator by Intemodino provides the option to generate numbers simultaneously in two independent intervals. Generated numbers are automatically saved so you can easily view them in the history list. Just click the History button or use the "back" and "forward" arrows to view previously generated random numbers. If you need any additional options or you need to tailor the program to specific tasks, for example, you need to generate decimal numbers, select random numbers from the list, generate multiple sets of random numbers, feel free to contact us about the custom version. • Generates numbers in one or two independent ranges. • Generates random numbers between 0 and 999 999 999. • Generates unique random numbers (without repetition). • Generates numbers of a given length (from 1 to 100 digits). You may exclude repeating adjacent digits. • Generates a single number or a sequence of random numbers. 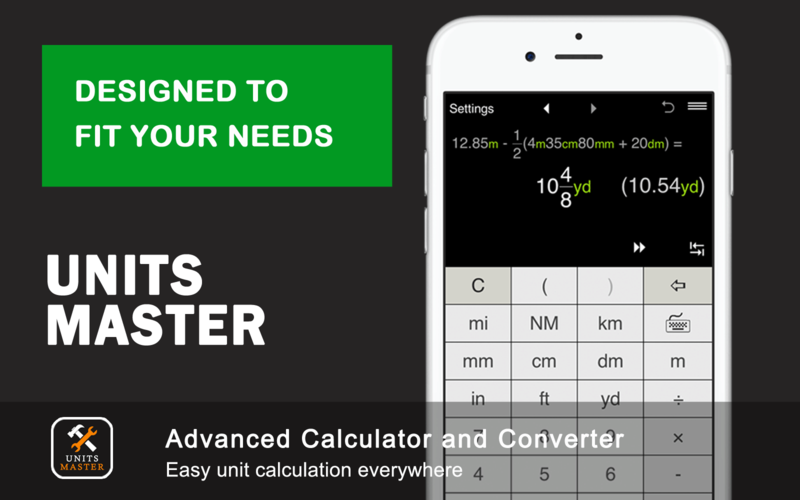 • Displays generated numbers in different formats. • Random numbers can be copied for pasting into other applications. • Keeps the list of generated numbers. • Sends results via email. The online version of Random Numbers Generator was initially released in 2012. Thanks to its intuitive design and functionality, it has rapidly gained popularity among users. 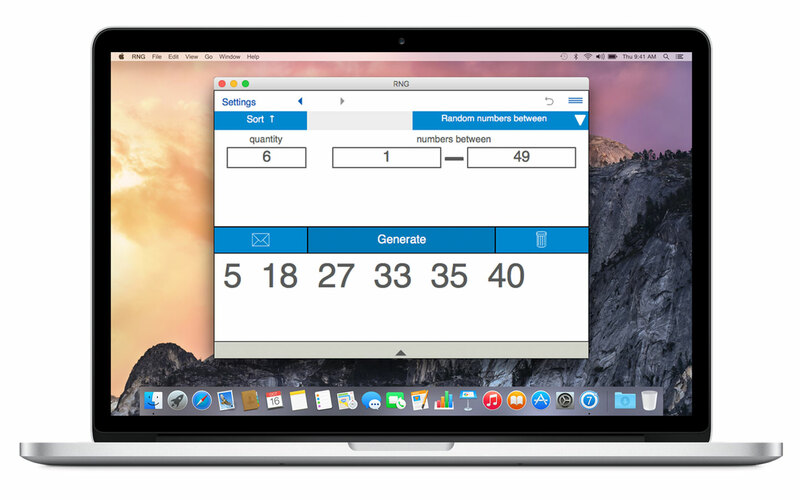 Therefore, at the request of our users, we developed a mobile version of Random Numbers Generator for iOS and Android, as well as the Random Number Generator program for Mac and Windows computers. 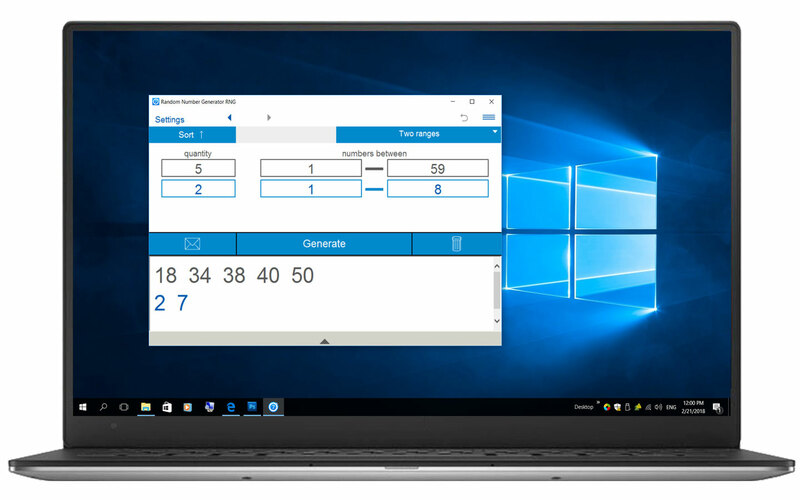 Now you may generate random numbers using our online service or install the Random Number Generator app on your computer, iPhone, iPad, iPod Touch or mobile device with Android. Stay up to date with the latest news about the Random Number Generator by Intemodino. This option is appreciated by many users as it makes it possible to generate sequences of random numbers from a given range without repeatition. We sometimes get feedback on Random Number Generator about getting duplicate numbers even if the "Remove duplicates" option is checked. It is not a bug. It could happen if the number of unique numbers exceeds the selected range. E.g. if you create 30 random numbers between 1 and 10, the range of numbers does not allow to generate 30 numbers without repetition. In this case you will receive a warning about duplicate numbers. In order to generate a set of random numbers without repetition, you can change either the amount of numbers or the range. 1. Select "Random numbers between" or "Two ranges". 2. Enter how many number you wish to generate. 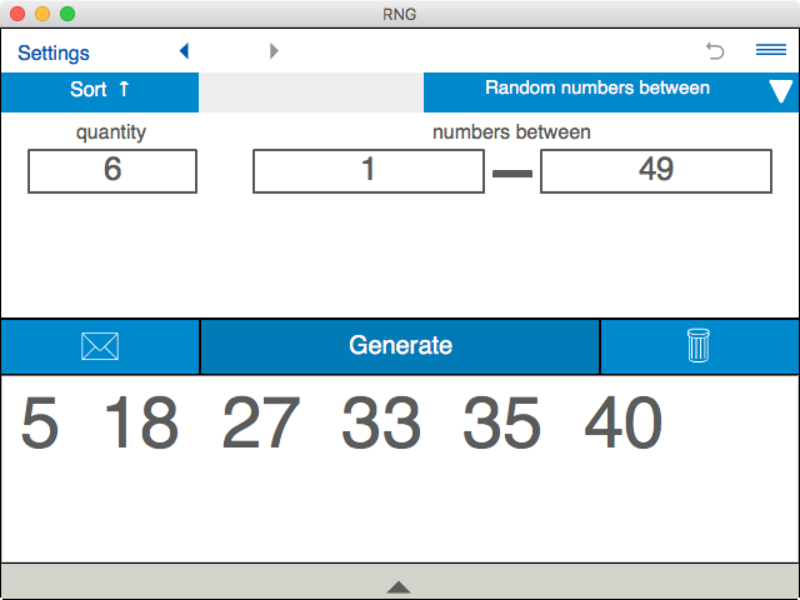 With the RNG app, you can create up to 200 random numbers. In the Settings window, you can choose if you want to display results in several columns or in a row. 3. Now choose the range of numbers - type the lowest and highest values. The lowest and the highest numbers should be selected from the range 1 - 999999999 and should have integer values. E.g. if you would like a random number between 1 - 100, enter '1' in the first field and '100' in the second one. 4. If you want to generate a set of random numbers without duplicates, so each number appears in the list only once, select the "Remove duplicates" option in the Settings windows. It is selected by default. 5. Click "Generate" to get random numbers based on the specified criteria. The mobile or computer version of Random Number Generator stores results until the application is closed. In the new version, we are planning to add the option that will allow users to choose whether generated numbers will be deleted from the history or not. The online number generator stores results until you close the page in the browser. Therefore, if you need to save generated numbers, copy and paste them in a file or send them via e-mail. If you need to generate a sequence of random numbers of a specified length, select "Random Number length" and enter the desired length. The maximum length is 100 digits. You may optionally select the 'Different adjacent digits' option in the Settings windows. 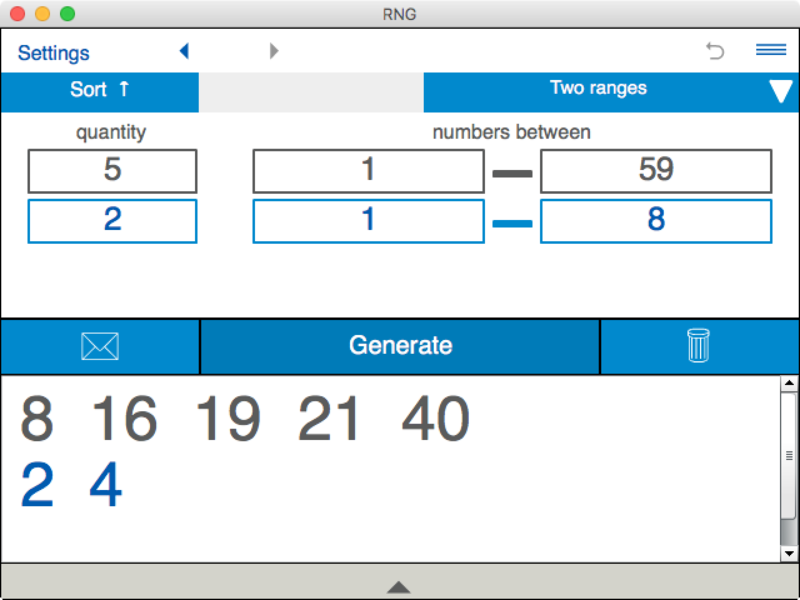 Random Number Generator is a must-have app when you need one or several random numbers. It produces random numbers based on your criteria and provides a range of useful options, which makes the app useful in a variety of situations. 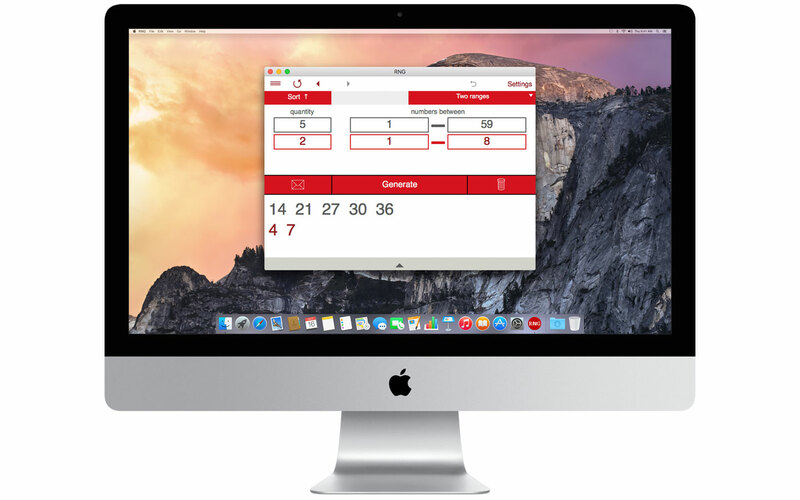 With Random Number Generator you can pick numbers for lottery tickets, generate random numbers to choose contest winners, choose teams, groups or partners for games, generate numbers for prize draws, raffles, gaming, researches, surveys, statistical tests, create lists of random numbers to train your memory. 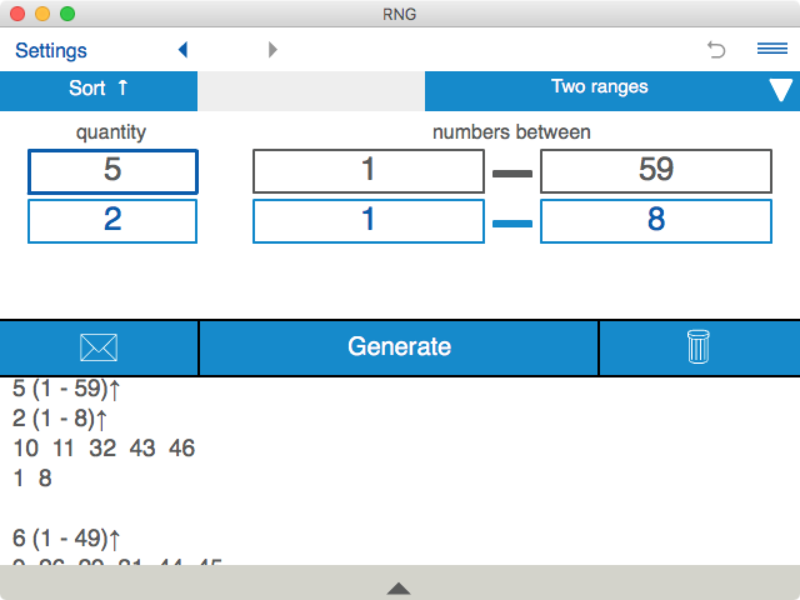 Random Number Generator is a great app for researchers, students and anyone who needs a quick way to generate random integers. Random numbers are often used in statistic. 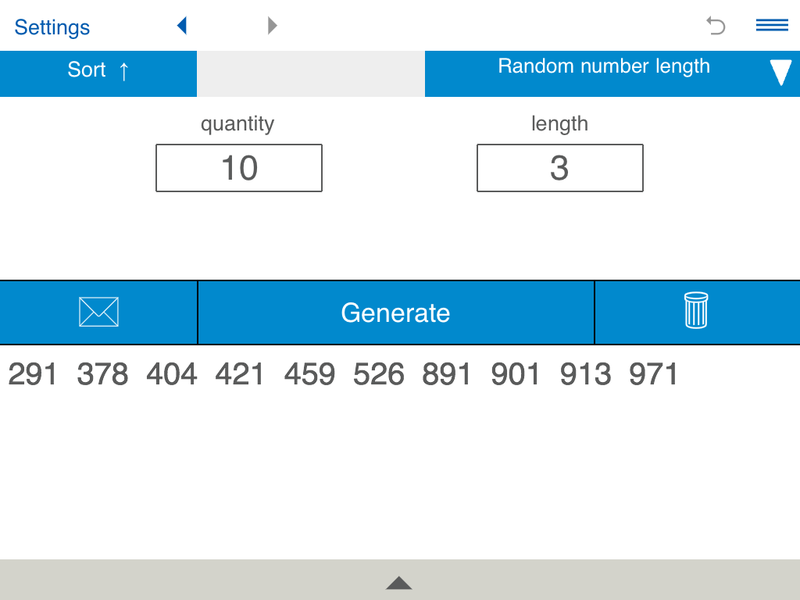 For example, the Random Number Generator app can be used to select a random sample from a finite population. Suppose there are 25 students in a class and you want to select two students at random. Due to the possibility of creating numbers of a certain length, you can create lists of random numbers for memory training. So, you can start with lists of 2-digit numbers, for example you can create a list of 10 numbers from 10 to 100, and then, increase the amount and the length numbers, creating lists of repeating or non-repeating 3-digit and 4-digit numbers. This generator can be used as the random coin flipper to simulate random coin tosses. It's very simple - assign one answer to "0" and the other one to "1", set the range from 0 to 1, enter the amount of generated numbers as "1" and press "Generate". 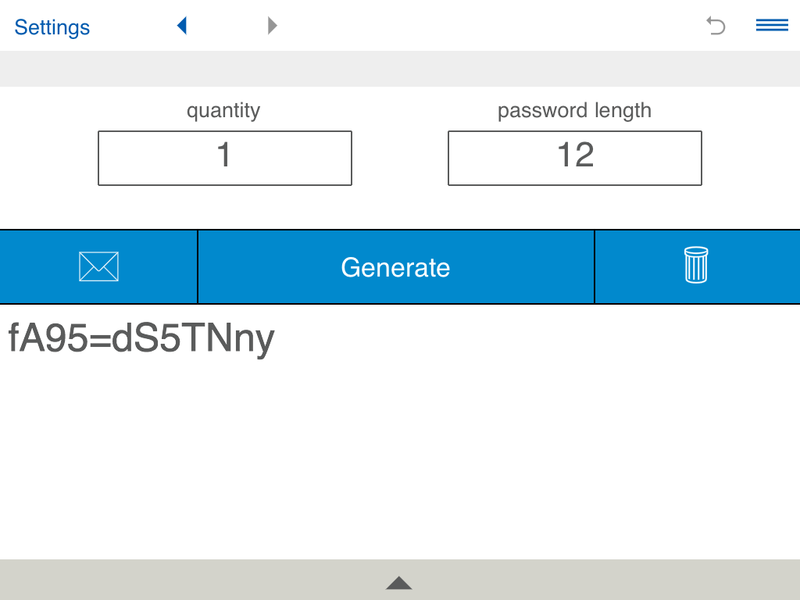 As of version 3.0.0, the mobile version of the app for iOS also allows you to generate passwords and create random strings. 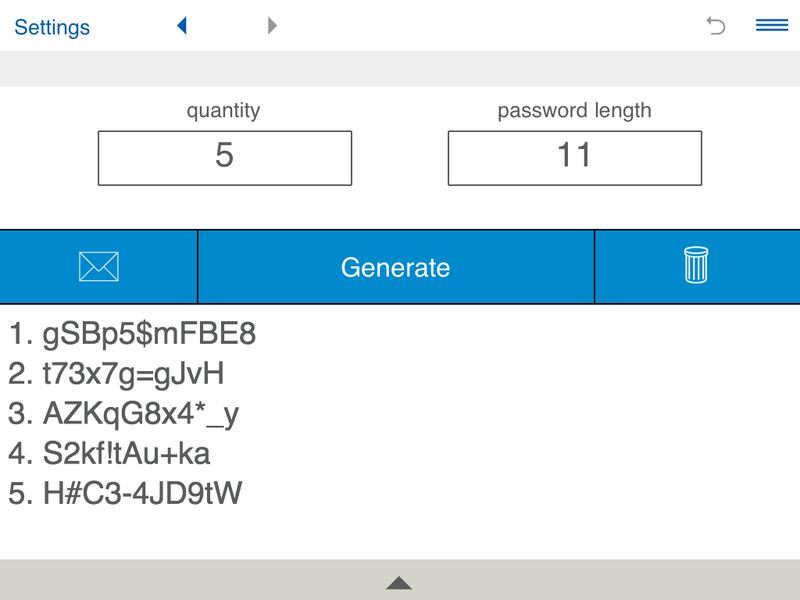 You can generate up to 200 passwords or random strings. Each string should be up to 100 characters long and could contain uppercase and lowercase letters, digits and special symbols. If you would like to choose one or more winners at random, our random number generator can help you with it. The Intemodino Random Number Generator provides the easiest way to impartially pick winners. If you use Random Number Generator, first of all, it is necessary to create a list of contest participants and assign a number to each participant. It is important that the list is publicly available. For example, if there are 50 participants, specify the range from 1 to 50. The amount of numbers for generation should correspond to the number of winners in the contest. Click the Generate button. Now you can make a screenshot of the result and place it on your webpage.